dinner party: what's for dinner, adam perry lang? Just as summer barbecue season is in full swing, we have a Q&A with grill master Adam Perry Lang. In addition to being the chef-owner of Daisy May's BBQ in New York, he is also the author of Serious Barbecue and the more recent BBQ 25: The World's Most Flavorful Recipes Now Made Foolproof. 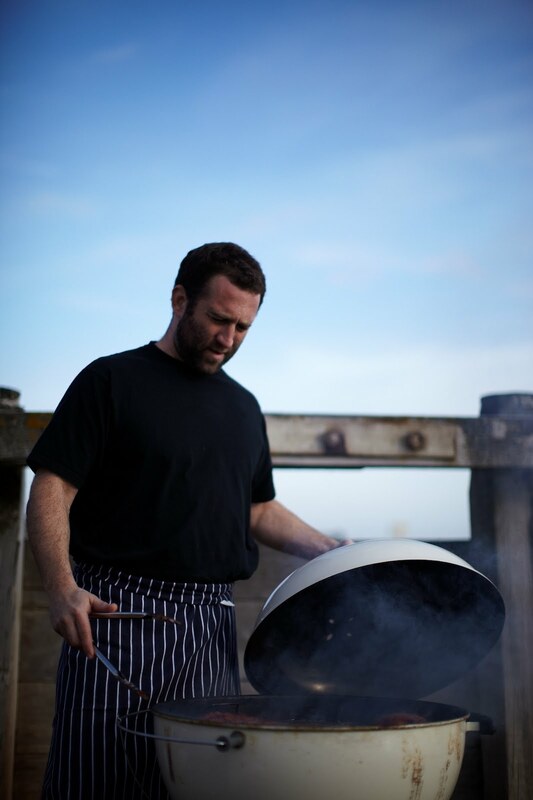 He is now based in London half of the year, working on a grill-centric restaurant called Barbecoa with Jamie Oliver. Here, he talks desserts, prepared foods, and why he likes people to help in the kitchen. Thanks, Adam! When was the last time you threw a dinner party, and who was invited? Just two weeks ago, my wife and I had four friends over, and we made roast beef and Yorkshire pudding in my new, true English fashion. What is the best menu you've ever made for company? I don't really think about the best meals I've cooked, I think about some of the amazing evenings I've experienced. One that stands out for me is a New Year's Eve where I made my wife caviar blinis and baba rhum and we drank Champagne all night. What's your preference: wine, beer, cocktails? What's your favorite dinner party soundtrack? I work to bluegrass, but for a dinner party I prefer to chill out to classical music. Some friends are coming over for a last-minute dinner. What do you make? Whatever looks good at the store closest to my house. I usually just run out to my local Panzer's (in London) and grab some great veg, make a quick stop at the butcher down the block and come home and whip something up. Start to finish, it never takes more than an hour. Do you usually cook everything yourself, or do you have help? I always let others help. I enjoy it. You never know what you can learn from someone else, and I also love to teach. Do you ever buy store-bought food, or is everything on your table made from scratch? I love getting prepared foods from ethnic places, like hummus and smoked salmon and marinated veggie and things, but wherever I buy them from I make sure they care about what they are doing. What do you like to serve for dessert? If you could invite anyone over for dinner (living or dead), who would it be? My grandfather, Papa Perry. I never got to cook for him. Great interview! I love that you do these--they are always so impressive. And BBQ sounds really good right now...I'll have to check out his restaurant! Thanks for posting a very interesting blog dinner party. The post about "what's for dinner, adam perry lang?" is really nice. Excellent comments for this summer in this post. Special thanks to author. Really very useful comments. Ellen: Thank you! I want to check it out too. I like a chef who serves hummus from the store for an appetizer.